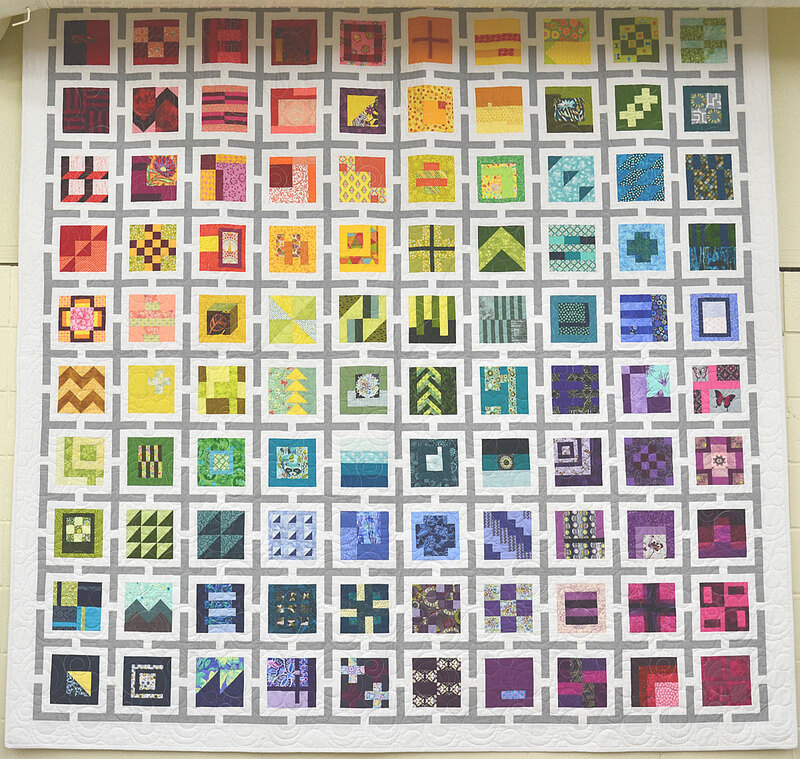 Over 2013 to 2014 we ran the 100 Modern Quilt Blocks by Tula Pink as a Block of the Month here at the store. Each month, for ten months, customers were mailed or picked up their package of 10 blocks. Previous blog posts were written about it here. 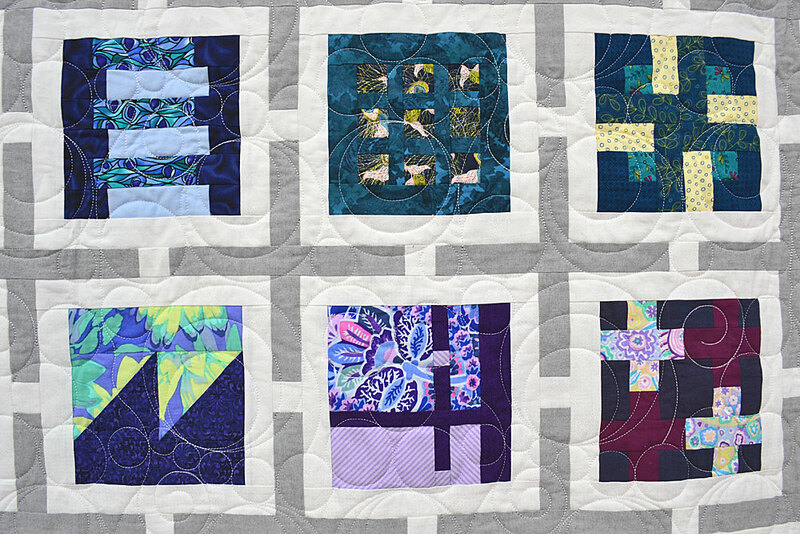 Pulling from the fabrics available in the store at the time, and sticking to a bright palette, I selected for each one and made them myself. However, I have not been able to find the time to sash and finish. However, our customer, Kate Friesen did! And as far as I know, she was the first to do so. She selected a different setting in the book, and I love it! 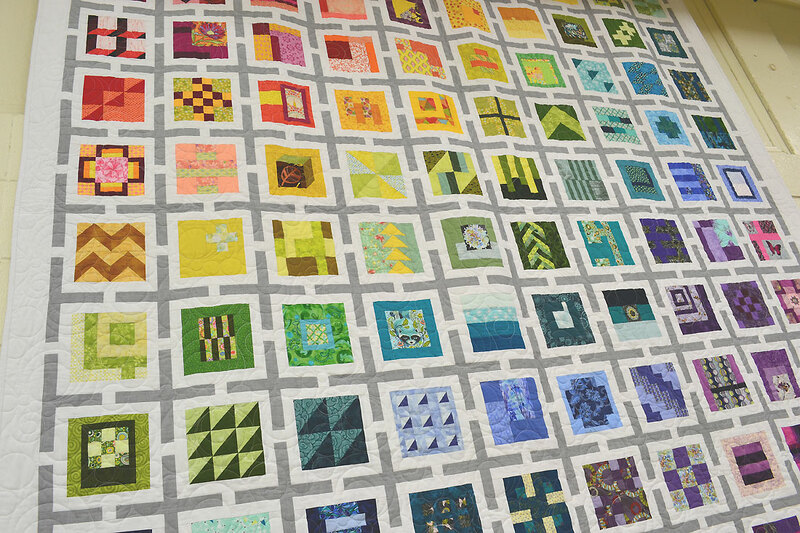 Kate has kindly lent us the quilt to hang in the store. Pictures are below, and clicking on them will give you a much larger image that is sharper. 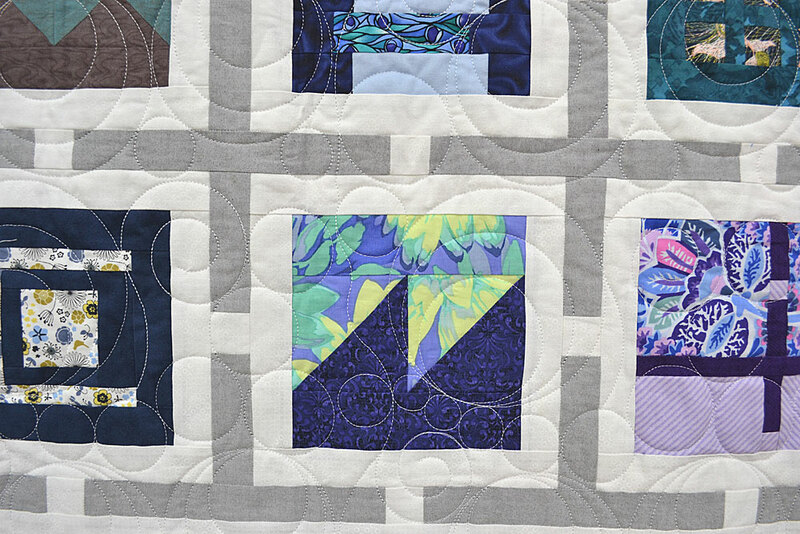 The quilt was long-arm quilted by Jane Goddard, who used the Circle Play 2 design by Designs by Vicki and white Glide thread. I have been meaning to write this blog post for years now, but something else always trumped my time. Usually something that was a little more “pretty”. You see, the fabric I am about to tell you about looks like plain brown flannel. It doesn’t photograph well. None of these items have been polished further; they emerged from the bag looking like this. I was shocked at how well they had stayed shiny. But thrilled too! 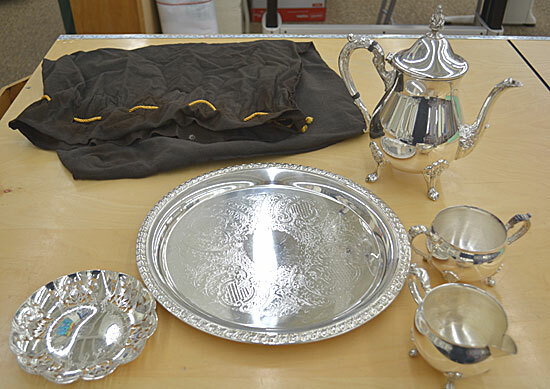 Just last week Jean had to polish some silver that we had used on display with our Downton Abbey fabrics. As you know, it is not a fun job. However, if you only use your silver on special occasions and don’t keep it out on display, this is the perfect solution to eliminating polishing. Pacific Silvercloth is a 38″ wide, brown-coloured flannel, that is embedded with thousands of fine silver particles. These particles absorb the tarnish producing gases before they reach the silver stored with it. Before first use, polish your items, as it will not take off tarnish that is already present. 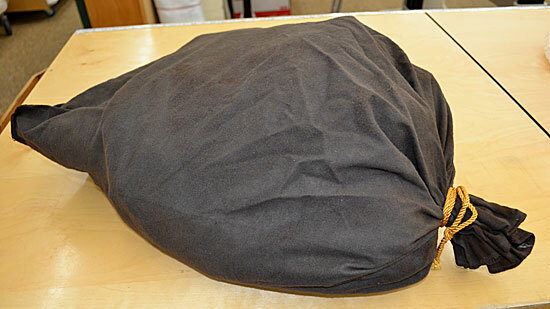 Then keep your silver fully wrapped in or stored with this cloth. The cloth will discolour over many years, but do not wash it, or it will lose its tarnish-preventing properties. It also helps protect against dust and scratches. Do not use it with rubber bands. The manufacturer also suggests lining drawers, cabinets, jewelry trays, or silver chests with it. I need to make some small bags just for my few pieces of silver jewelry. We sell this cloth here at the store (I am a believer!). Click here to see it on our website. If you come in to the store, please ask a staff member to find it (we don’t keep it on the shelf with the other fabrics).